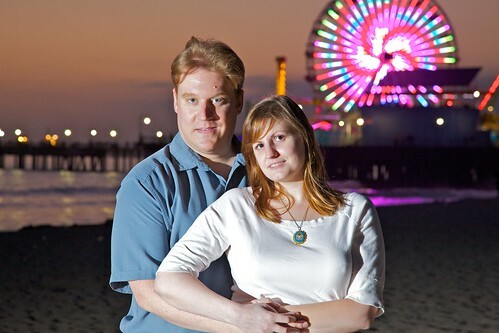 Here are Emily and I near the Santa Monica pier, just after sunset. I used a Canon 430EX along with a Radiopopper transmitter, receiver, and “cube” to move the flash off to the left. 430EX was duct taped to Emily’s strobe stand because I didn’t have the proper hardware. Moving the flash off-camera can have a dramatic effect on your lighting. Click here to see larger versions of this photo at Flickr. you guys look like brother and sister. eeeww. Well we are NOT brother and sister, we are husband and wife. Grow up.